How did these statements resonate in Sikkim? Having worked with the farmers on the ground for more than four years, this speech by our prime minister did not go down in our minds as usual political gibberish. All the farmers with whom we have worked were exhilarated by the announcement that the government will help in capturing global market for organic products. Though the promise of a possible “global market” outreach does paint a rosy picture, the Sikkim Organic Mission (SOM) has had its share of woes since inception. Launched in 2010, the vision of SOM was to convert 50,000 hectares (ha) of agricultural land into organic cultivation by 2015. The Sikkim government, with the support of almost 67 per cent of the population who are dependent on agriculture for their sustenance and livelihood, has been successful in keeping its promise. Chief Minister Pawan Kumar Chamling proudly says, “Now it is just a matter of getting an organic certification, as we are already an organic state.” But for Sikkim’s farmers, the unknown journey of “organic” has just begun. And they realise this. As Sikkim was only partially dependent on synthetic farm inputs like pesticides and manure, shifting to organic was easier. But neither farmers nor the government was able to perceive the probable threats (biotic and abiotic) to their agriculture when they shifted from conventional to organic farming during the past four-five years. Earlier, farmers used synthetic pesticide sprays on most crops. This practice has now stopped, but with no alternative for pest control. Pest attacks are today higher than ever before. Take the case of the Sikkim Mandarin Oranges. 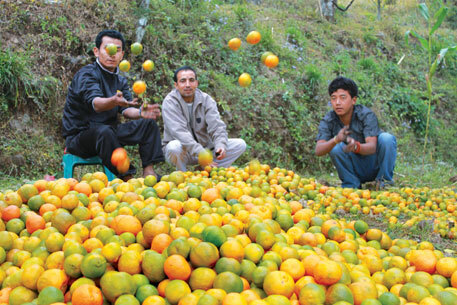 One of the major crops in Sikkim, these oranges have been cultivated in over 8,320 ha, with an annual production of about 14,390 tonnes, making it an important source of livelihood and income generation for Sikkim’s farmers. During the organic transition phase, Mandarin Oranges were affected by the fruit-fall disease. The trees were infested by stem borers, bark-eating caterpillars, fruit-sucking moths, fruit flies and other pests. Orange trees which used to bear more than 2,000 fruits during a season four years ago, hardly give 500 fruits now. Traditionally, farmers used to dip cloth in kerosene and apply it in holes of borers or spray a mixture of cow’s urine and local plants like titeypati (Artemisia) or banmara (Eupatorium) available in the surroundings. Now, farmers feel that the number of pests have increased dramatically and traditional knowledge of pest management is failing. Farmers are reporting even new variants of pests and diseases. People across India are familiar with the taste of Nagpur oranges, but very few are even aware that Sikkim Mandarin Oranges exist. This could be attributed to various factors such as dearth of agricultural infrastructure, lack of endorsement, etc. Existing cold storage facilities are inadequate and marketing channels or mechanisms to promote organic products are yet to be developed. These facilities need to be provided, especially for those who grow perishable products such as fruit and vegetables. For instance, it takes two days for the Sikkim Mandarin Oranges to be transported from the farms to the busy markets in Kolkata, where it gets sold as Darjeeling Kamala-lebu (Darjeeling oranges). Even a day’s delay can spoil the fruit. In the long run, considering Geographical Indication (GI) certification for its unique agricultural produce such as the Sikkim Mandarin Orange, cultivation of large cardamom and ginger, which have a longer shelf life, may be helpful if Sikkim works towards endorsement of its organic produce. As individuals cannot file for a GI tag, the government should facilitate the formation of farmers’ cooperative societies and strengthen its support during the certification process. When an agricultural product from Sikkim gets sold in the market with the tag of another place (mostly Darjeeling), the whole idea of turning Sikkim into organic state and the hard labour put in by Sikkimese farmers in producing organic products is lost. Kolkata is the major market for all Sikkimese agricultural products. But neither Siliguri nor Kolkata has loyal buyers for organic produce from Sikkim. So Sikkimese producers cannot fetch the desired prices. There is no existing market for a Sikkimese organic product—locally or regionally. Almost 90 per cent of organic produce that comes out in the market from Sikkim is competing with conventional farm produce of neighbouring states and countries. The latter fetches a better market because customers are not aware of the goodness of “organic food” and they do not wish to pay more for it. Developing a local organic market and better marketing channels with proper brand recognition is critical, particularly for fast perishable products. The Sikkim government is trying every possible way to endorse its organic products—they have opened the Sikkim Organics store in Delhi and few organic stores across Sikkim. But their priority should be to build local customers not only in Sikkim, but also in neighbouring Darjeeling, Siliguri, Jalpaiguri, Dooars and Kolkata. Given Sikkim’s strategic location, efforts to tap into the international market for organic goods must be initiated in Bhutan, Nepal, China and Bangladesh which are closer than many Indian states. An aggressive market-oriented action plan will enable the growth of Sikkim’s organic produce and fulfil the dreams of Sikkim’s farmers, while ensuring the success of the noble organic mission of the Sikkim government. Organic Farming is not a New Concept. It has been practiced since time immemorial. There are constraints for wider cultivation by Organic Farming. With dwindling Cattle power,animal dung is scarce in villages. Moreover Market for Organic Farming products. Since the cost is more,compared to chemical Farming,The Farmers of Former are at a loss. These are good for politicians but in practice bad for Poor Farmers !